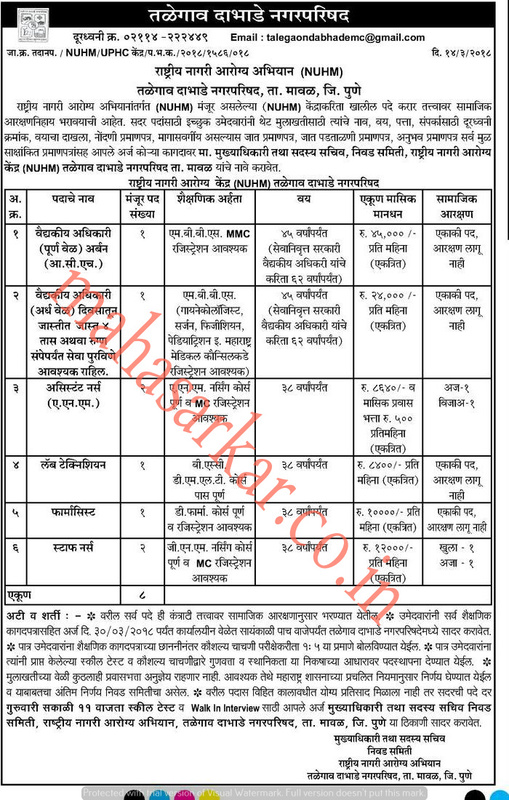 Talegaon Dabhade Nagar Parishad (Talegaon Dabhade Municipal Corporation),Pune Published Job Notification for 08 Medical Officer – Assistant Nurse & More Posts. Candidates who wish to apply must look at Talegaon Dabhade Nagar Parishad Medical Officer – Assistant Nurse & More Recruitment 2018. Eligible candidates can join Walk-in Interview on 30-03-2018. Education Qualification: MBBS/GNM/ANM/B.Sc/D.Pharm and More. For Post wise Education Details follow the detailed advertisement. Age Limit: For Medical Officer (Part Time/Full Time) posts 45 Years and for others 38 Years. Interested & Eligible candidates may attend for walk in interview along with all the documents addressed at मुख्याधिकारी तथा सदस्य सचिव निवड समिती, राष्ट्रीय नागरी आरोग्य अभियान, तळेगाव दाभाडे नगरपरिषद, ता. मावळ, जि. पुणे. Starting Date, Last Date to Apply Offline at Talegaon Dabhade Municipal Corporation which candidates should be remembers as follows.